This recipe is quite simple to prepare at home and has an awesome hot and spicy taste. 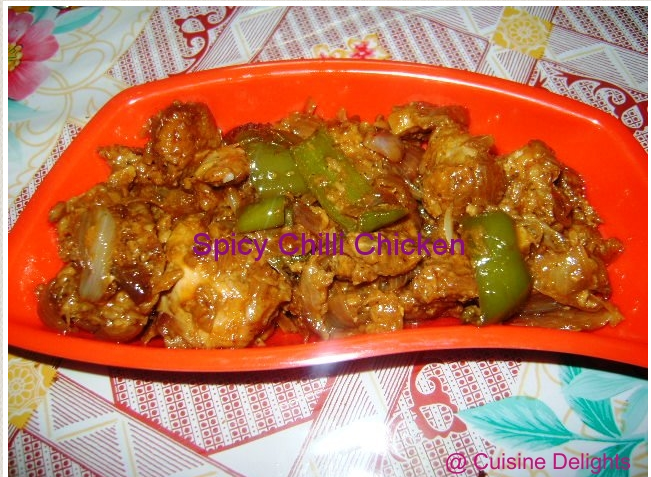 Chicken is cooked with lots of chilli and tastes yummy. I just love to enjoy this dish with fried rice, roti and naan. Chilli sauce : 2 tbsp. Wash the chicken piece and dry them. Heat oil in a wok and fry the marinated chicken pieces. Keep the fried pieces in a separate container. In the same oil add chopped garlic when goes aroma then add onion and saute untill golden brown. Then add capsicum and green chilli, saute it is is soft. Now add soya sauce, tomato sauce and chilli sauce. Mix to coat all the chicken with the sauce. Stir-fry for 5 mins. Now finally add cornflour in water and allow to boil covered for 5 mins on low flame. This chilli chicken was served with fried rice.